Millions of Americans suffer from chronic pain. Atrinity can help families or friends who suffer from such conditions and educate those who experience pain on how to control their symptoms. 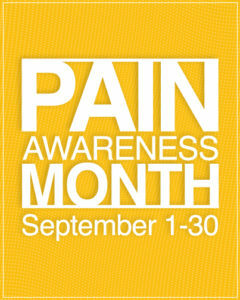 In 2001, The American Chronic Pain Association established a pain awareness campaign with a goal of working with the media and public forums to educate the public on the reasons people suffer from chronic and acute pain and what they can do to receive treatment for it. Physical therapy can help patients recover quicker from pain following surgery or injury. If you experience pain, it’s important to educate yourself about your condition and available treatment options. All of Atrinity Home Health’s therapists are trained to utilize modalities which increase strength faster and decrease pain during therapy. When you feel good, you will want to participate longer and work harder during your physical therapy. Your therapy should be customized to your individual physical needs. A Physical Therapist can develop a program so you’re successful in achieving your goals. Technology is changing in every industry and healthcare is no exception. The right electronic therapy equipment can improve your progress, decrease pain and maximize your ability to feel good. A professional healthcare organization such as Atrinity Home Health can help you manage your pain by assessing your individual situation and designing a program that helps you feel better faster.